Tesco has withdrawn a planning application to build a superstore on the edge of Omagh. The retailer was supposed to be the anchor tenant for the Opportunity Omagh development on the Derry Road. Earlier this month, a planning consultant acting for Tesco wrote to the Planning Service asking that the processing of the application should be "stopped immediately". Tesco could still possibly submit a revised application in the future. The letter from the planning consultant refers to the passing of a time limit for a deal between Tesco and the Opportunity Omagh developer. It states: "Due to the legal contract between the applicant and the developer in relation to this site having passed its longstop date, we wish to withdraw this application with immediate effect." A 'longstop date' is a legal term which means that if certain conditions are not met by a certain date then one of the parties to a contract can walk away. 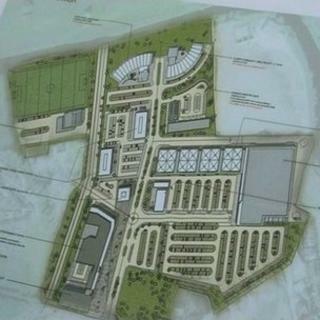 Opportunity Omagh is being promoted by the Guernsey-based Orana Group, which is owned by the developer John Farmer. It is a 37-acre site with outline planning permission for various business and leisure uses. The first phase of a new link road is also supposed to be built in conjunction with the scheme. George Long, a Londonderry-based consultant acting for the developer, said it was "by no means the end of Opportunity Omagh". Mr Long said that while there was a retail element in the plan, it was a mixed-use scheme not reliant on retail. "We've always been clear that Northern Ireland needs jobs other than retail," he said. "We are looking at a range of opportunities and we have investors who are in a position to take a long view on this. "Realistically, schemes like this take 15 years to come together." A Tesco spokesman said the company was not pursuing the application "at this time, but will continue to consider opportunities to invest in Omagh". The Orana Group is also planning a major development at Crescent Link in Derry, which is due to be anchored by a Sainsbury supermarket. Last year, the group lost control of the Outlet Centre in Banbridge to Ulster Bank. Meanwhile, planners have recommended that a 7,000 square metres superstore closer to the centre of Omagh should get the go ahead. It is on the Mountjoy Road, at a site known locally as Scotts Feeds. The recommendation is due to be discussed by Omagh Council's planning committee next month. The developer is Corbo, one of Northern Ireland's largest retail landlords. The company, controlled by Sam Morrison, already owns the Showgrounds Retail Park in Omagh. Its other properties include the Fairhill Shopping Centre in Ballymena and the Cityside centre in north Belfast.